This study investigates how researchers are disseminating their scientific outputs (e.g., through online CVs and homepages) in astronomy & astrophysics, public health, environmental engineering and philosophy to better understand their Web presence and how it could be evaluated. This study is a part of ACUMEN (Academic Careers Understood through Measurement and Norms) project which has been funded under European Commission’s Seventh Framework Programme (FP7) for Science in Society (for project details click here). What information does the survey collect? The form asks seven questions: 1) the name of your university 2) the name of your group or department 3) your gender 4) your academic post 5) the URL of your online CV or homepage (if any) 6) the URL of your list of publications other than your CV and 7) the URL of other websites (e.g. a blog) where you may use for scholarly communication and discussion. Your participation in this survey is completely voluntary and your specific responses and personal details will not be shared with people outside the ACUMEN consortium and no personally identifiable information about you will be put on the web. How was your email address selected for this survey? Your email address was randomly selected from published papers indexed in the Thomson Reuters Web of Science (WoS) during 2005-2011 in your field. In each discipline we took a random sample proportional to the total emails in each country and university. Consequently, countries and universities with more published articles in WoS have more representatives in our final sample of academics. How will the information that you provide be used? The data you provide would be used exclusively for statistical analysis and interpretation of the overall results about web presence of scholars at institutional and country levels which help future planning for using web for scholarly communication. The information that you provide are being gathered and processed by the Statistical Cybermetrics Research Group (SCRG), University of Wolverhampton, UK which is responsible for the Web presence study in the ACUMEN project. We may use the URL of your online CV or publication page for further Webometrics analysis by downloading a copy of it to explore how your web-based scientific outputs are reported and being used. Your data will be collected with a secure online form using SSL encryption technology and will NEITHER be disclosed or shared to any third parties outside the ACUMEN project NOR will any individually identifiable information be released in any publications (e.g., journal and conference papers). Your data will be stored for the duration of the project and up to one year after its official completion date and after February 2015 will be permanently deleted. At any stage before this you have the right to request that your data is permanently deleted. 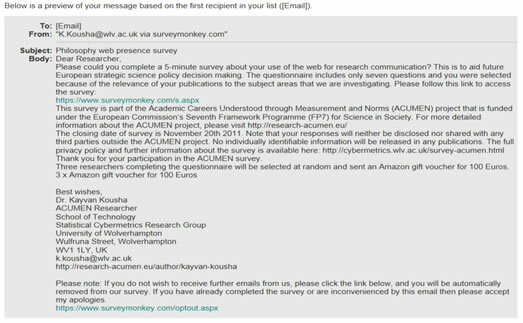 For this, please email k.kousha@wlv.ac.uk or any email address belonging to the ACUMEN consortium. Your data will be deleted as soon as possible and in all cases within 28 days. This survey complies with the UK Data Protection Act 1998 and nothing in this statement overrides your rights under this act. Please see the SurveyMonkey Security Statement here: http://www.surveymonkey.com/Monkey_Security.aspx for the safety of information collected by the survey. 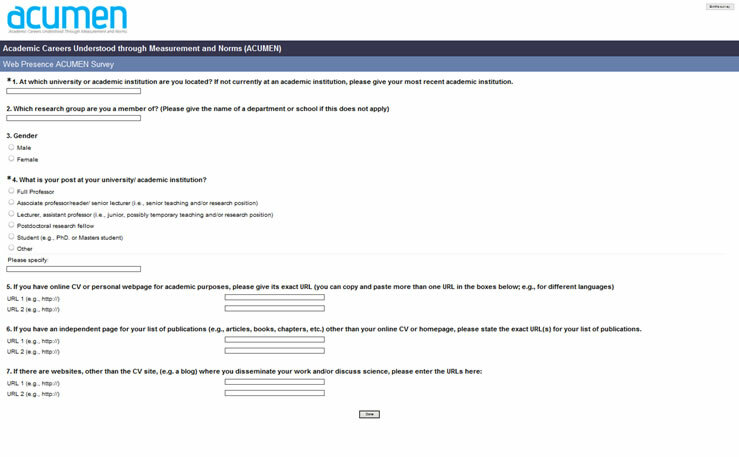 By completing the assigned form, you agree that the responses can be used by authorized ACUMEN project team members for research purposes and might be used anonymously for relevant science policy decision making and strategic planning in the European Commission’s Seventh Framework Programme for Science in Society. Contact information : If you have any questions about the ACUMEN project or the privacy statement and data protection, please email k.kousha@wlv.ac.uk or any person belonging to the ACUMEN consortium. This survey is now complete. Below is information about the survey for readers of the article based upon it.